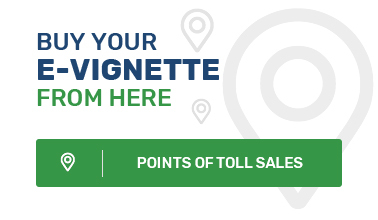 As of 16 August 2019, for passing the toll road network the owner or user of the vehicle with total technically permissible maximum weight over 3,5 tons should pay a distance-based charge – a toll, instead of the vignette charge paid until now. The payment of the toll entitles the vehicle it is paid for, to travel a definite distance between two points of the respective road or the road section. The toll shall be determined depending on the technical characteristics of the road or the road section, on the distance travelled, on the category of the vehicle, number of axles and on its ecological chacteristics, and is determined for each particular road or road section. This product is suitable for vehicles over 3.5 tons having more frequent and regular trips on the paid road network. The measuring mechanism for tolling purposes is through an on-board unit mounted in the vehicle, which sends data necessary for calculation of the due toll. The data are sent to the electronic toll collection service provider with whom the user has signed a contract for electronic toll collection on distance basis. The latter itself processes the incoming data and prepares and sends a declaration for a distance-based charge (toll declaration) to the Electronic toll collection system operated by the Road Infrastructure Agency in its capacity of entity collecting road charges. Road Infrastructure Agency levies the due charge to the electronic toll collection service provider who pays it, and the relations in connection with its payment by the end user to the service provider are regulatedin an individual contract signed between them. In the case the user of the paid road network has no mounted on-board unit but another tracking system based on data received from a GNSS, the data of that system may be sent by the toll declaration data provider with which the user has contractual relations, to the electronic toll collection service provider or directly to the toll charger, who, after additional processing, should calculate the due charge. In this case, the due charge is being levied directly to the user of the toll road network, and the toll declaration data provider has no obligation in relation with its collection. This product is suitable for vehicles over 3.5 tons used for “occasional” trips. Owners and users of vehicles with technically permissible maximum weight over 3.5 tons who have not have on-board units or navigation satellite systems and no concluded contract with an electronic toll collection service provider or with a person acting as toll declaration data provider may use the toll road network upon purchasing a route pass. The route pass is a toll product based on distance travelled within certain time period for which it is valid. The route pass is issued against advance payment of toll and allows one vehicle of the abovementioned category to pass a single distance within the scope of the toll road network from an initial to a final point, with additional preliminary stated by the user interim points which may not be more than four. The issuance of a route pass is subject to preliminary calculation and payment of the toll due. The road user should be registered for being able to buy a route pass, but has not to sign a contract with an electronic toll collection service provider. Further to implementation of the toll system in Bulgaria, the Road Infrastructure Agency (RIA) is in process of determination of the tariffs as well as the road network to be tolled. For that purpose, RIA has signed a contract with the World Bank, which will offer consultancy services for determination of the tariffs and the domain of the toll road network. They will be proposed for public discussion and will be adopted by the Council of Ministers after preliminary approval of the European Commission. In the coming months and with approaching the implementation of tolling as of 16 August 2019, RIA will provide additional information.